Tantallon Castle, quality - made all the more impressive by being a debut design. And here's a Peek! And indeed I enjoyed so much, I went straight back out there and played a rare 9 holes from the back. And here's the 'As Live' 6½ minute edit of that cool little visit too. 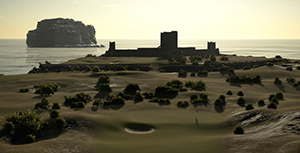 Fun watch..
Chelsea Saint @ Tantallon Castle | Front 9 Back Tees | 'AS LIVE' 6'32"
Been a little while fellas, but our latest SP-Elite is certainly worth the wait.. SPE-17 @ ? And to compliment, here's arguably the most picture perfect 'Par-fect Ambience' to date.. Absolutely spectacular Scandinavian treat showcased now - and we'll merrily pay a visit Weds 10-12 April for our OGIO Open. An Arctic Fury course with just 300 plays? Wonders never cease! But regardless of the relatively scant attention - it's still a VERY worthy T-Ready venue. We'll be goin! Mornin all. Perfect example of a CSP here. A lowly played but charmful, easy going T-Ready venue - from a relatively unknown CGC member/designer. Certainly worth a leisurely weekend trip. Another gifted designer - another beautiful course. But who, and which golfing haven are we visiting today? A charming Boreal treat now from established designer and CGC regular Bigcat Wayne. Hop on over - very worthy. A nicely crafted 18 here from another relative rookie CGC member/designer. A sultry, inviting, welcoming venue - suited to the more casual player. We go Mon 29 April for our ANZ Australian Open. Exciting news fellow golfers. With the recent creation of CGC's 'Course Review Committee' - more great courses than ever before are being recognised and rated by The Casuals. Which means our Sneak Peeks will now cover THREE courses per episode! PLUS - each venue will now receive a percentage rating. No need for three holes per course now, just the one - with our trademark aerial Green sweep featuring on ALL courses. It's an exciting advancement for our growing series - and we hope you enjoy the 300% bigger, 300% better - Casuals Sneak Peek Evolution! NOTE - Ratings are not always my own. Casuals Course Review Committee gradings are predominant. Three more beauty drenched venues now and all boast a feature dear to the CGC... Crowds! Some aren't keen on the tournament ready thang - but the vocal atmosphere they provide, is for me, key - when hosting our big events.